Notorious Guns N’ Roses frontman Axl Rose is infamous for his squabbles with numerous industry mates. This time however, we see Rose’s more amicable side, as he and GNR greet AC/DC’s lead guitar monster Angus Young a happy birthday. 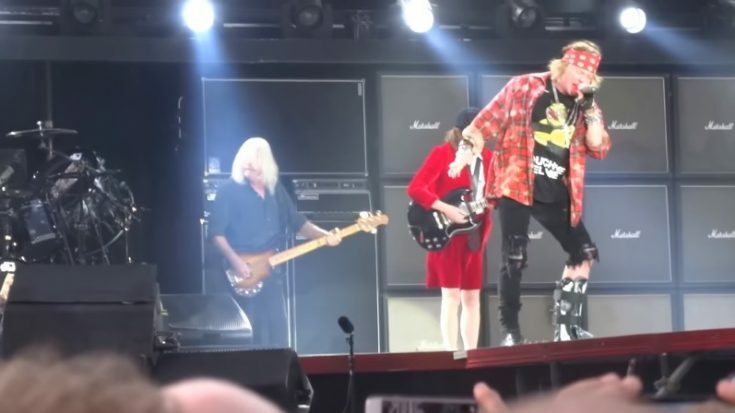 Rose joined AC/DC on there Rock or Bust World tour way back 2016 as their new lead vocals, after Brian Johnson announced his hearing injury. Although there photos of Brian Johnson in the studio are surfacing online recently, Rose hasn’t left AC/DC as of yet. While bassist Cliff Williams has announced his plans for retirement by the end of the 2016 world tour, he was photographed with Johnson and Phil Rudd in the studio with AC/DC last year. Meanwhile, AC/DC’s Angus Young has been reported by BBC as a generous donor to Canadian hockey referee Steve McNeil’s Alzheimer research charity organization. Young has donated in memory of his late brother and former rhythm guitarist of AC/DC Malcom Young’s devastating dementia diagnosis, which ultimately led to his death in 2017. Steve McNeil hails from Toronto, Canada, but has been travelling across the country and head to its NHL cities, and skate for 19 hours and 26 minutes. McNeil says this effort is to raise awareness and funds for local Alzheimer societies. This is a tribute to his mother, who was also a victim of the neurological disease, and for Malcom Young as well, who perished to the disease at age 64, in 2017.